I am looking for a lost toy. It is a Pokemon Torchic plush doll. The tush tag had Pikachu behind a pokeball on one side,the other tush tag had the pokemon logo,2007 Jakks Pacific,info about Jakks Pacific,”Contents may vary in style,color,shape and decorations than images shown on package or in advetising.” and the Jakks Paciffic and Pokemon copyrights. The same thing is repeated in French. My Torchic was sent to the church, and I miss her! It was my first Pokemon plush ever! 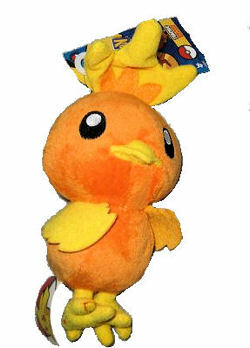 If you can help Jillian find this 2007 Pokemon Torchic plush Doll, THIS SITE IS NO LONGER ACTIVELY MANAGED. Please use Our FREE FACEBOOK GROUP, including #091108-6 in the subject, . There are many TORCHIC POKEMON at ebay: 250291409702 ; 270273213238 ; 190249991649. I’ve written Jillian. Thanks again Tami! Thanks Katty,but I did not mean BanDai or Hasbro Pokemon Torchic. I’m looking for the Jakks Pacific version of Torchic. I’ve written her. Thanks Liza! and I’ve also written YOU!! There are two penguins on eBay right now, but we have someone else looking for it, too. Yep, pay it forward does work!!!! If you are still looking this may be your plush.